Pre-heat oven to 350 F. Melt the butter with the oil over medium heat in a pan, add the onions and garlic and cook until soft and beginning to brown. Remove from the heat and let cool completely. In a large mixing bowl combine the ground beef, ground pork, beaten eggs, bread crumbs, milk, salt, pepper, oregano and fennel. Mix well with a large spoon or use your hands (but wear a pair of surgical gloves to prevent cross contamination of bacteria). When mixed well, add the cooked onion mixture, parsley and grated cheese; mix everything together again. Cook a small piece in a frying pan and taste it to see if the level of salt and pepper is to your liking; adjust if necessary. Form the mixture into 1 1/2 ounce balls, a #14 ice cream scoop works well for this portioning. Pat and compress together well and place in an oiled baking pan. Bake for about 25 minutes or until the internal temperature is 145-150 F. Remove from the oven and cool. 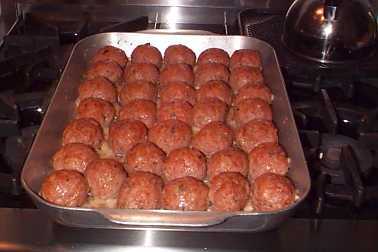 You may serve the meatballs plain or with a sauce.